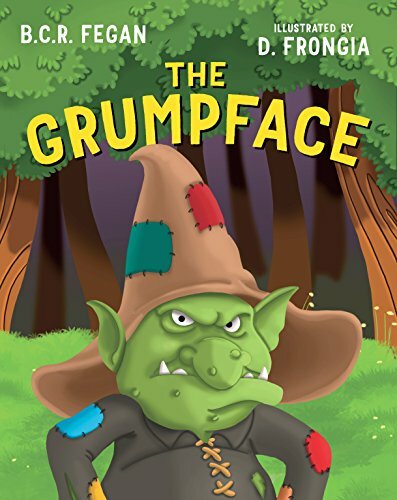 The Grumpface is a charming children’s book about a grumpy old man in a forest and Dan who needs to find a flower for his love. What was the inspiration for this charming kid’s book? What inspired me to write The Grumpface was seeing that particular grumpy face a child pulls when things aren’t going their way. I have witnessed it on so many occasions, and each time I find it hilarious. What makes it so funny is that quite often parents will naturally try and make the young child smile or laugh. Sometimes this is all it takes to break the curse, yet often this only serves to make them more determined to remain grumpy. The Grumpface himself is the character that embodies this determination to remain grumpy and resist anything positive or amusing. In this sense, he goes beyond the grumpiness of a child and becomes the identity of the pessimist or those caught up in negativity. Dan on the other hand is the natural antithesis to the Grumpface’s outlook on life. He is optimistic and hopeful even when things aren’t working out for him. His quest for love actually provides the setting for negativity and positivity to meet head on. I felt that this book was good at teaching morals of persistence, compassion, and friendship. What themes did you try to use when creating this book? First and foremost I wanted to create an enjoyable tale that excited the imagination. Rather than beginning with a theme, I started with the desire to inspire the imagination. I remember as a child reading some books that were enjoyable, and others that held such intrigue, that they challenged your perception about life. This is really where I tried to begin. I wanted to forge a tale that was memorable, inspiring and filled with adventure. What better way to do this, than to write a new kind of fairy tale. The morals that were subsequently woven into the story though were intentionally light and simple. It has unfortunately become common for children’s books these days to be so distracted by the message, the tale itself seems to be an afterthought. As you have already mentioned, there are a number of morals such as persistence, compassion and friendship that come up in The Grumpface. Yet for the most part these morals simply arise naturally through the considered development and interaction of characters. As mentioned previously, perhaps the most overarching theme in the book is simply the power of positivity over negativity. The art in this book is lovely. What was the art direction like and what decisions went into choosing the right images? The art direction for The Grumpface was a little unique and certainly experimental. Every other children’s book has been briefed with an overarching ambience and emotion that I’m hoping to convey. Each page of text is then detailed down to the perspective of the scene, the emotional response of the characters and any unique aspects to the setting. I am still open to any deviation from the brief if the illustrator is compelled to try something different, but the brief provides a place to begin. For The Grumpface, I wanted the illustrator to try something different. Instead of providing strict direction, I wanted Daniela to simply draw the scene that the text conjured in her mind. As a fairy tale, it was important to that the text carried enough depth and richness, so that even without pictures, it would still capture the mind. Daniela was very open to this and would send a short summery of her thoughts for each page (which would be approved or slightly amended) before providing a draft. At this point there might be some minor adjustments. When all the drafts had been complete, there was a final check to ensure that everything flowed smoothly before the final drafts were created. This particular process meant that the illustrations took considerable time to complete and get right, but in the end it worked out well. The book has received numerous comments on the artwork and the impact they have on the tale itself. I think Daniela did a great job! The next book will be available on the 3rd of August 2017 (so not long now). The title is Henry and the Hidden Treasure, and it is about a child who attempts to defend his pocket money from his little sister. Henry is convinced that Lucy is a secret ninja spy who has been sent to steal his treasure and he therefore constructs some elaborate defences to try and stop her. The book highlights some important themes such as listening to parents, being nice to your siblings and carefully considers what constitutes real treasure within the family context. Henry and the Hidden Treasure also introduces children to ordinal numbers in a subtle and imaginative way. Like The Grumpface, my first priority with this coming title was constructing an exciting and imaginative tale that children will find themselves thinking about long after it has been put down. It is my hope that the many tales to come will continue to provide that magic and inspiration for children young and old. The Grumpface is a tale in the spirit of any grand adventure. It is about a clumsy young inventor’s quest for love, and the challenges he must face to find it. But it is also a tale of bravery, absurdity and happiness, and the power of these qualities over negativity and sheer grumpiness.